Swansway Group has thanked firefighters who battled to contain a fire at its Stafford Land Rover dealership overnight. More than 30 firefighters were called in to tackle the blaze at the Crewe-based group’s Land Rover premises, on Mustang Drive, Stafford, overnight after fire broke out in the facility’s workshop at around 7.45pm. AM understands that the fire involved two cars in a workshop, and about a third of the building was damaged, however no casualties were reported after fire crews successfully contained the blaze. At the height of the fire six fire engines were at the scene and the operation continued until 6am today (November 7). David Smyth, director of family owned Swansway Motor Group, said: “Our thanks must go to Staffordshire Fire and Rescue; they were at the scene very quickly and the fire was contained within a few hours and for that we’re extremely grateful. “The fire has caused some damage to the workshop, but at this point, the extent of the damage is unclear. Our main focus is on getting the site back up and running so we can minimise inconvenience to our customers”. 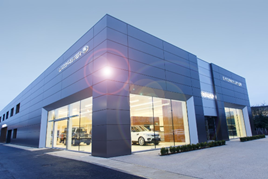 Swansway’s Stafford Land Rover centre opened in 2015 and was named Land Rover Dealership of the Year in both 2016 and 2017.